House at 8 NW 42nd Terr. i of the Rev. Moon. kg," says Rabbi Rubin R.
see if we can't get them out." young people and recipes instead. newspaper free in the beginning. Jsured Israel that the U.S.
i are an obstacle to peace. idy of its aid needs. that this would not affect U.S.
prepared a "feast of fashion"
fiscal year beginning Oct. 1. Israel has asked for $3.45 billion. displeasure will have are unclear. comparison with the 1979 drive. Al Latter, Marshall Linsky, Dr.
p.m. at Congregation Beth Israel. Suncoast Restaurant especially for the buffet and fashion show. Donald Stein and Steve Zibel. Spector, Al Ward and Lew Gross. the chairmanship of Dr. Paul R.
over halfway towards the goal. order to further their cause." Waiting list sign up welcome. highlight of the winter quarter. Yiddish tunes and rock music. (Scroll of Esther) will be read. can be both meaningful and fun." best ones we have today." sic Hebrew III 3 hrs. (4) History of Judaism 4 hrs. from 5 p.m. 7:00 p.m.
evening of bowling and fun? rest is up to you. and join the JCC Jewish Singles. sample of your hand writing. the evening in Tarpon Springs. Singles and what we're all about. it will become a monthly affair. Saturday, March 8 8 p.m.
observed: The Annual Intercongregational Service. much more there is that unites us, than separates us. growing as we look around the sanctuary. Service. Let us all join together. by the National Conference of Christians and Jews. willing to help whenever called upon. time and energy to share. Thanks to you, too. special programs wi! be scheduled just for them. horrors of the Nazi period will not be forgotten. meet at such a gathering. is twice Chai (18), the Jewish symbol for life. well as to express the Jewish national consciousness. Mae Ad i Wns Ns <-! are coming back to haunt us. we will not. in Ameria..
And so it was at \_. been taken out of context. farch 27, from 5 to 7 p.m. I what we stand for. can be of help to you. Synopsis of the Weekly Torah Portion! nacle, so that God could dwell among them. In the Tabernacle, or Mishkan, there was to be a Holy Ark. table of acacia wood, bearing 12 ballot the "showbread"
equal in number to the Twelve Tribes of Israel. overlaid with gold, and resting on four posts of silver. the Curtain divides the Holy Place from the Holy of Holies." The Tampa's Women's Division tops its goal of $20,000!!! was before chairwomen were invented) were Mrs. David L.
Mrs. Zielonka for sharing this picture with us. of the Mossad has been Gen.
indeed, one of profound respect. has only a very faint notion. University. Shown from left to right: Michael L. Levine. the Federation Women's Division, and Ben Greenbaum. president of the Tampa Jewish Federation. nth. and Libya, with $6,910. badly While not in the top 20. Number one on theGNP scale. from $ 18 to $24 a barrel. party, contact Cheryle Rosenberg of "Arty Party." Sarasota: and. proud great-grandparents are Mr. and Mrs.
welcome. Jill, we're really glad you're here. Car and Hyde Park Tea Room. another is going to make new paper from old! hollowed out a candle ma glass of water. the Congregation of Beth Israel that a decree has been issued. then begin, with the assembling of all the families on Sunday. goodies, and t he sounding of the Grogger. Victor) over the forces of evil." the symbol of the petropo"**! i this week featuring Dr. I The Joys of Yiddish. home of Ina Rae Levine, were: Cindy Sper, who with Mrs.
1 ine is editor emeritus. [ turesque Pocono Mountains of N.E. Pennsylvania. Art Consultants or hosting an Arty Party in your home. the destiny of our people. Seven Years? How long is Time? "When will the Messiah come?" stantinople by the Turks (1453). to this type of calculations. descended and stood before Him. to appeal to Jewish Voters. recognizes Israels right to exist. lit 111 i: Sen Howard Baker (R..
see it as part of a future "
a m Daily: Minyan, 7:15a.m. 3303 Swann Avenue 876-2377 Rabbi Frank Sundheim St"
Jewish Student Center (USF), 3645 Fletcher Avenue, <-o . We're Cutting Carpet Prices From Head To Toe! f h ked up b> the li'j . Sale Prices Include Expert Installation Over Luxury Rubber Padding! e Decorator multi-colors. Te. ific values! e For the most discriminating! B'nth/Hillel Foundation Washington's Birthday Party 8 p.m.
Tampa Jewish Federation Board Meeting 7:30 p.m.
South Florida B'nai B'nth/Hillel Foundation "Proiect Renewal"
for these people." he continued. Would we now geek to! lization and are members of BB1. 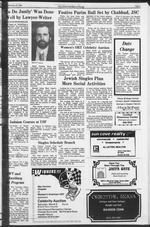 Klutznick was president of both BBYO and BBI. than 300 persons, including U.S.
Jed by Federations for local purposes. * Court for the District of North Dakota. | ruling was issued in the case of Ring v.
; public schools in the district. special convocation at the Usdan Student Center. events as lectures and concerts. Mrs. Helen Weil, 55, a social worker, and Mrs.
munity services for the aged. might weaken its defense ability. week \ isit to the United States. accords in the Knesset. Asked if. will requinfal least $5 billion. oil (a day) she is seeking." Mandelbaum Gate. I never did. that he conveyed no messages. company at the end of this year.